A garbage disposal makes it easier to clean your kitchen while also reducing the amount of waste that you send to the landfill. Rather than sending food scraps out with the trash, where they can take years to decompose at their final destination, you can dispose of them with your wastewater by using a garbage disposal. Unfortunately, sometimes the larger food scraps can clog the garbage disposal, and it usually seems like this happens at the most inopportune time. On the bright side, if you do have a clogged garbage disposal, you can likely fix the problem yourself without having to call in a plumber. 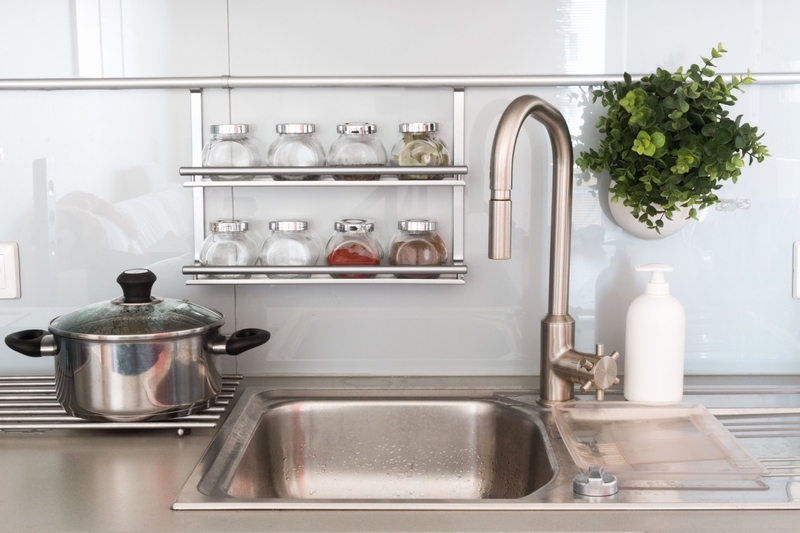 Follow these tips to clear your garbage disposal and keep it running like new. Before exploring some of the more complicated reasons why your garbage disposal might not be working, or before investing a lot of time and money in repairs, it is important to make sure that the garbage disposal has adequate power. Open the cabinet under the sink and locate the power cord connected to the garbage disposal. Make sure that it is connected to the outlet. Next, check the breaker and make sure that it is in the “on” position. Lastly, locate the power switch underneath the garbage disposal. Turn it off and on again to reset it. Flip the power switch on the wall outlet to see if the issue has corrected itself. If power is not the issue and the garbage disposal is still not operating correctly, be sure to unplug the fixture before pursuing the next course of action. Many people believe that a garbage disposal works similarly to a blender, with blades that grind up food particles before sending them on their way. However, garbage disposals do not have blades. Instead, they use an impeller to force food waste against a grinding plate to liquefy it before sending it down the drain. With this design, it is easy to see how a garbage disposal can get clogged. In order to unclog it, dislodge the item stuck against the plate, and then pull it out. If the garbage disposal makes a low humming noise when you turn it on, then there may be something caught. Find an Allen wrench that is the proper size for the bolt located on the underside of the garbage disposal. Use the Allen wrench to turn the drum back and forth several times. This motion will hopefully free the obstruction. For safety reasons, you should never place your hand inside the garbage disposal — even if all of the power is disconnected. Instead, use tongs to reach inside the appliance. Once you have dislodged the obstruction, lift the flaps over the drain and look inside. Use the tongs to remove the item and dispose of it appropriately. Fixing a clogged garbage disposal can be a pain, so it is best to prevent a clog from occurring in the first place. The easiest way to do this is to avoid overloading the garbage disposal. Only place a small amount of food waste into the disposal, and then turn on the cold water and run the disposal until the food is all clear. Repeat the process in small batches. Garbage disposals are not immune from grease clogs. Do not assume that the appliance can cut through grease and send it down the pipes. Using cold water with the garbage disposal causes the grease to congeal, which can clog the drain and the appliance. Instead, place the grease in a container for disposal in the proper facilities. Keeping your garbage disposal running like new is easy and inexpensive. Simply cut a lemon in half and toss it in the garbage disposal. Grind it up for 30 seconds to 1 minute while running the cold water. The natural acids in the lemon help clean the appliance and the drain pipe while leaving everything with a fresh scent. When it comes to using and repairing a garbage disposal, it is a good idea to follow a few dos and don’ts. Doing so will keep this handy feature running properly for many years. Don’t pour grease down the drain. Don’t overfill the garbage disposal. Remember that vegetable scraps make great compost, too. Don’t put your hand inside the garbage disposal, ever. Do use cold water when running the garbage disposal. Do grind up food matter completely before turning off the appliance and the water. Do clean the garbage disposal once per week to keep it running like new.